This information is for those identified as early adopters for Cisco WebEx. This document describes adding a Webex meeting to an existing meeting or adding a Webex meeting. Early adopters will have to re-add Webex meetings that were on the old wisc.webex.com URL and recreate the meetings on the new URL- uwmadison.webex.com that took effect July 23rd, 2018. 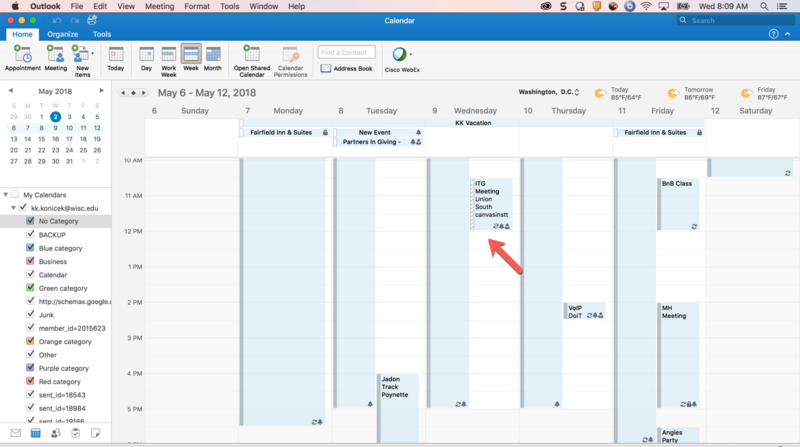 How to add a Webex meeting to an existing calendar meeting in OUTLOOK DESKTOP version. (Mac or PC). Select an existing meeting you wish to add a Webex meeting to so participants can attend the meeting virtually. You can also Start a new meeting click on Cisco Webex icon in Outlook. Next open the meeting you wish to add a Webex meeting to. Double Click on the meeting invite in the calendar to open it. Then Select Add Webex meeting. For the PC this will be closer to the left side. Lastly, once the Webex meeting is added you will see this text below. You will not see the actual meeting invite information for the Webex session until this is on the calendar. You may type information above the text that says "Do not delete or change any text below this line-" Click Save & Close in the upper left corner. This will return you to the calendar to see the detail information of the Webex meeting invitation.